Keep files and papers organized in the durable portfolio. 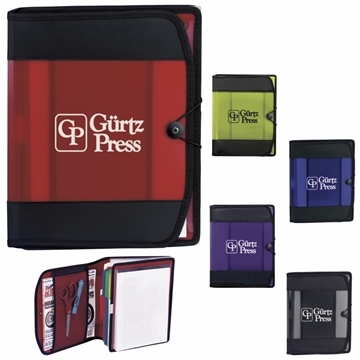 The 5-section accordion-style file and writing pad make this the perfect business accessory! Five-section accordion-style file on left with bungee-cord closure. Price was great. It was the quality I expected and everything else was excellent. Very durable material with true representation of the graphics. Was happy that I buy a lot from you (for my little business) and I do like working with the same person, Veronica is GREAT!! Great work - I would have liked the nice product to be in the same color.